Chromebooks still sit at number two and three on Amazon’s best-selling laptop computer range, as well as 1-6 in the highest rated section, so it would make sense for a company as large as Lenovo to jump onto this market. 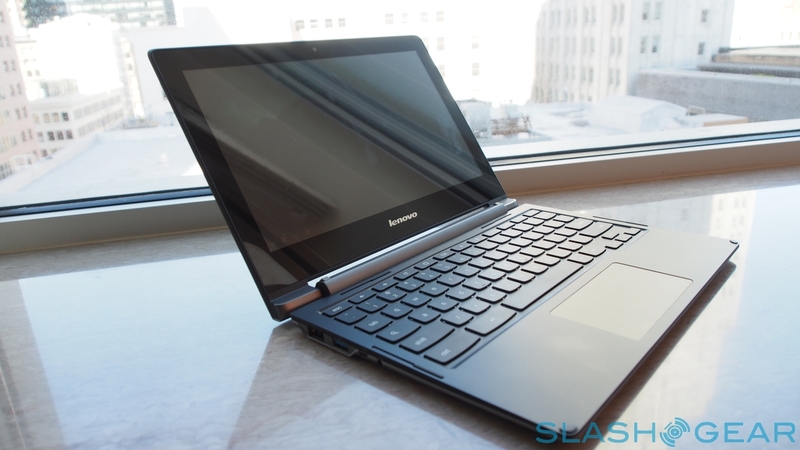 Lenovo has released Chromebooks in the past, namely the ThinkPad 11e and Yoga 11e both for education, but the new N20 and N20p will be the first available to the general public. 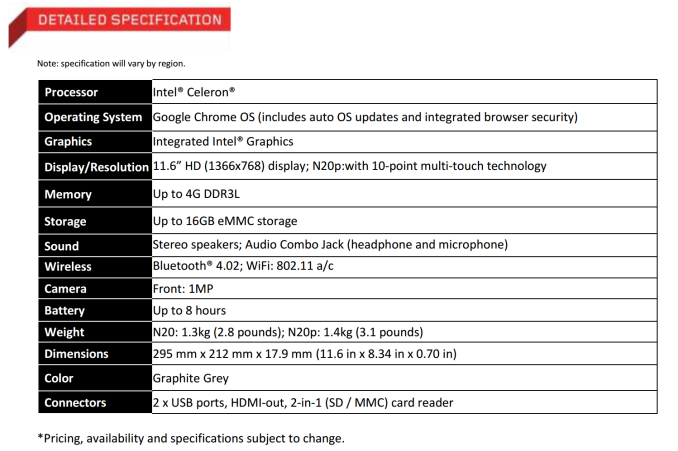 I am awaiting a response from Lenovo for exact specifications and more images, however both models will feature a Celeron processor and a 1366x768 11.6-inch screen, with the N20p capable of 10-point multi-touch. Both models will come with 16GB internal NAND plus 100GB of cloud storage, as well as having what Lenovo call 'a full-sized keyboard and oversized trackpad' for ease-of-use. Lenovo mentions WiFi and Bluetooth connectivity, however not the standard or the implementation. Maximum depth of the device is 17.9mm and it weighs in at 1.4 kg (3.1lbs). 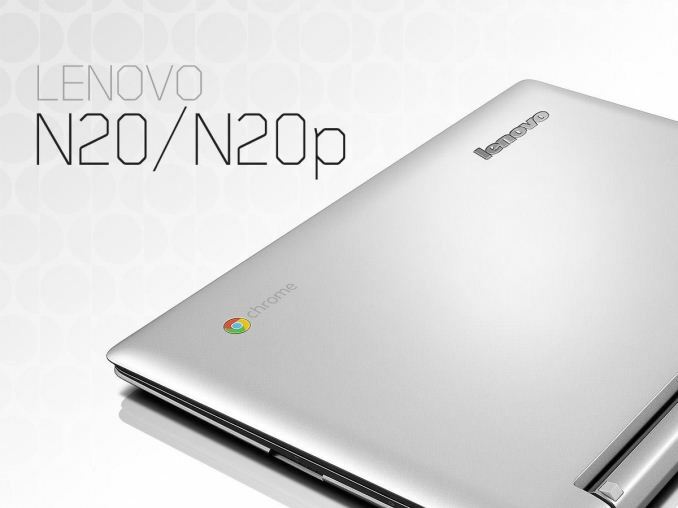 The N20 is a regular laptop design, whereas the N20p will feature Lenovo’s multi-mode technology, allowing the screen to be rotated 300 degrees into a ‘stand’ mode for watching videos and interacting with others. Both workbooks will allow opening, editing and sharing Microsoft Word and Excel files, and the batteries are rated at 8 hours. Prices will start at $279 for the N20 and $329 for the N20p, which will be available from the beginning of July and August respectively, and I expect we might see one at Computex. Actually other sources that have been up close with the device pre-launch have reported the $329 model having 4GB DRAM, and gives the WiFi as 802.11ac. To put the price/specifications in perspective, a similar priced model on Amazon for $285 comes with the Haswell-based Celeron 2955U 1.4 GHz processor, 2GB DRAM and 32GB internal storage. they aren't that significantly more dependant on streaming and cloud than any other computer. They have HTML5 offline support, they have packaged apps, NaCL, and other technologies that allow you to be productive without an internet connection. The 16GB is standard. The entire idea of a Chromebook is to function as a thin client. There is growing off-line utility depending on specific apps. But the general paradigm is constant or near-constant connection to the net - which is actually pretty accurate for most people in a lot of places today. The low storage on board is a mind-shift for many people. However it's really integral to the thin client idea.